K.G. Subramanyan (1924-2016) While studying economics at Presidency College, Madras, Subramanyan became involved in the freedom struggle, during which time he was imprisoned and debarred from government colleges. The turning point of his life came when he joined Kala Bhavan at Visva Bharati in Santiniketan in 1944, completing his studies in 1948. Between 1951 and 1959, Subramanyan was a lecturer in painting at the Faculty of Fine Arts in Baroda. During 1955 and 1956, he went to the Slade School of Art in London to study as a British Council research scholar. From 1959 to 1961, Subramanyan was Deputy Director (Design) at All India Handloom Board. Bombay. He continued to be a design consultant till 1966. He went back to Baroda as Reader in Painting between 1961 and 1965. From 1966 to 1980, Subramanyan was Professor of Painting at the Faculty of Fine Arts in Baroda. He went to New York as a J D Rockefeller 111 Fellow (1966 – 1967). From 1968 to 1974, he acted as the Dean of the Faculty of Fine Arts, Baroda. In 1975- 1976, he attended the World Craft’s Council meets as a delegate. In 1976, he was a Visiting Lecturer at various Canadian universities. In 1980 Subramanyan moved back to Shantiniketan and till 1989 was Professor of Painting at Kala Bhavan. During 1987 and 1988, he lived at Oxford as Christensen Fellow in St. Catherine’s College. In 1989, he was appointed Professor Emeritus at Kala Bhavan, Visva Bharati. Subramanyan affected a synthesis of modern with traditional art, creating a unique cultural space between the east and west in his own work. The confidence to do so arose in part from the intellectual climate of Shantiniketan of the 1940s. Here the formal distinctions between fine art and craft were broken down into a curriculum, which sought to liberate creativity and the imagination by tapping resources already available in the local environment, rather than searching for them in alien legacies. The impact and influence of early modernists like Binod Bihari Mukherjee, Ram Kinkar Baij, and Nandalal Bose, whom Subramanyan was fortunate to have as his teachers, along with his own sensitive and profound philosophy, are factors that have contributed to his long, sustained and prolific career. Thematically Subramanyan’s canvases reveal a culture and society that are tumultuously involved in a grand civilizational moment of transition. A master of exploring various mediums, his recent oils and acrylics on canvas, reverse paintings on acrylic and gouaches were showcased across India in 22 exhibitions to commemorate his 90th year.The artist gave the human figure a new dimension. Drawing upon the rich resources of myth, memory and tradition, Subramanyan tempered romanticism with wit and eroticism. With his characteristic vigor Subramanyan, revealed a world that is fantastic, tragic and absurd and yet, a world where he shared with us his wonder and expectation. With wisdom, wit and gentle irony, Mani da, as he was lovingly known to one and all, fashioned potent fables of our time. A theoretician and art historian as well, Subramanyan has written extensively on Indian art. His writings are foundational for the study of contemporary Indian art. He has also written and illustrated delightful fables for children. A man of multifaceted talents, in his practice, Subramanyan broke the barrier between the modern artist and and the traditional artisan. He experimented with weaving and toy-making. He also reinvested several mediums earlier used in Indian art, for example, the terracotta mural and glass paintings found a new lease of life with his experiments. 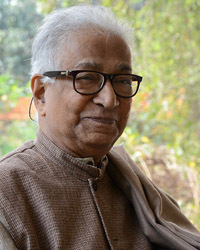 K G Subramanyan received the Kalidas Samman in 1981, the Padma Shri in 1975, a D. Litt. (Honoris Causa) from the Rabindra Bharati University, Calcutta in 1992 and became a Fellow of Kerala Lalit Kala Akademi in 1993.Subramanyan’s works are significantly represented in E. Alkazi’s collection of contemporary Indian art.